Poet, lyricist and music composer Guru Krushna Goswami is a flamboyant personality in the field of Oriya literature, film and music. Born in the year 1934 near Baripada to Gokulachandra Goswami and Sraddhabati Goswami, he has over 1600 folk,devotional and modern songs to his credit. He is the celebrated lyricist of over 30 Oriya feature films, from Maa (1958) to Ranabhumi (1994). His name evokes fond memories of a galaxy ofevergreen songs such as Mu Je Janena Kaha Bata, Phulei Rani Sajaphula, E Banara Chhayi, Antare Kande Bahare Hase Mu, Sei Chuna Chuna Taraphule, etc. His poetry books include E Mana Chorapathe (1967), Samuduni Mor Juhar Janiba (1967), Abanigandha (1998), Jagadihudi (1998), Namami Janmabhumi (1999), Champakbarani (2002) and a collection of Hindi devotional songs on Lord Jagannath, He Jagannath Tujhe Pranam (2006) which has already been released by T-Series in 2 cassettes – Jay Jagadish Hare and Jay Jagannath. He is also the story-writer of Arundhati (1968) and dialogue-writer of Suryamukhi (1963). He has coveted several prestigious awards including the Best Lyricist Award (1996), Bhaktakabi Salbeg Award (2000), Orissa Sangeet Natak Akademi Award (2000) and many more. Q. You have acquired over 50 years of vast experience as a poet, lyricist and music composer for All India Radio, Cuttack. How do you juxtapose Oriya film and music of yesterday and today? with my family to watch a newly released film in a local theatre. We thoroughly enjoyed it. However, after some days, a friend of mine rang me up and told me to watch a Marathi film on Doordarshan. To my surprise, the Oriya film we had watched was nothing but a discourteous remake of the Marathi film. Really, ignorance is bliss. He then asked the music director to go ahead and start composing music for the film from that auspicious day. The music director remarked, "Sir, already the music has been graciously composed. I wonder the role of a music director in your project. Only you need to deploy a lyricist to pen down words on the metre." Perspiring heavily, he beseeched to be excused and allowed to take leave. He could only heave a sigh of relief back home. So, if such kind of grotesque and horrendous modus operandi prevails in our film industry, how can one expect of good quality film and music? Q. You are considered as one of the innovators in the field of Oriya film and music. What was your driving force? films had been churned out successfully, only 12 Oriya films had been made in Orissa by that time. It was really a matter of grave concern. So we pledged to form a team work in order to elevate our position in the Indian film industry. These 12 films, released till 1960, are Sita Bibah (1934), Lalita (1949), Sri Jagannath (1050), Roll 28 (1950), Saptasajya (1951), Amari Gaan Jhia (1953), Kedar Gouri (1954), Bhai Bhai (1955), Maa (1958), Mahalaxmi Puja (1958), Sri Lokanath (1960) and Parinam (1960). I have seen all these films except Sita Bibah. I made my entry into Oriya films by writing lyrics for two songs for the film Maa (1958). I didn't ask for any remuneration from the producer, Gour Ghosh. But I received 50 rupees compulsively for the next film ‘Nua Bou’ by Panchasakha Pictures. I am mentioning this only to reflect that none of us had any commercial interest, rather we had a dedicated and collaborative spirit to churn out the best. Q. What, according to you, should be the theme of lyrics and poetry? A. Poetry/ lyrics should be written in an introspective, contemplative, spiritual and philosophical mood. Not that it should be written professionally to gain fortune and popularity. It is a very sacred pursuit. In poetry, empirical philosophy of the poet should metamorphose into soul-elevating and soul-emancipating lyrics in simple, common man's language. If this is not followed, it will cause immense harm to the readers/ listeners as well as to the poet himself. I don't wish to elaborate further as it will only smirch my tongue. It's the job of a film/music critic. They should spread the awareness. Why should I interfere? In fact, the answer to your query has already been conveyed in a poem 'Kabita Go…' from my first poetry collection 'E Mana Chora Pathe (1967)'. The song was aired from All India Radio's 'Sajaphula' programme in 1965-66, composed by Late Bhubaneswar Mishra and sung by Atish Kumar Mazumder. Q. How did you start writing poetry? How did you gain confidence in the profession? A. I started writing poetry since 1952 when I was 19 or 20 and studying in college. Since a tender age, I had a very keen interest in music and literature. I was ambitiously dreaming of being a poet and a lyricist for All India Radio, Cuttack and also penning lyrics for Oriya feature films. At that time, I came in contact with eminent music director Shantanu Mohapatra who asked me to write a song for him. I worked hard for 2 months to pen it. The song, 'Katha Geeti Dhara Ma' was an instant hit and I never looked back. variegated themes. In fact, my professional success helped me build my self-confidence. It was not built in a day or two—it took several years. Q. Do you feel the demand for commercially-rewarding songs is detrimental to good, soulful compositions? A. Verily yes. No need to ask such a question. But in All India Radio there is no commercial obligation, so the staff lyricists should take their own time and mood to create good, memorable songs. Compositions for radio are totally different from those meant for films/ albums. Q. Please let us know some of your best compositions till date. an anecdote in this context: Once I had composed a song "Tumei to mor kalira konarka, E katha jani mu murkha…" (please don't laugh) for Akashvani's Sajaphula programme which was sung by Chitta Jena. The song was highly appreciated because those were my heydays but one day while at the All India Radio (Cuttack) premises, comedian Late Dinabandhu Das (Tima Bhai) summoned and reprimanded me for writing such an absurd song. He argued that I mustn't enjoy my popularity by writing such bizarre songs at fancy and get unprecedented acclamation. I submissively admitted that everyday in an artist's life can't be a day of joy. Q. The glorious days of Oriya films when music equally dominated the scene are a myth today. Why it is that such films are not seen these days? A. Well, let me repeat again. 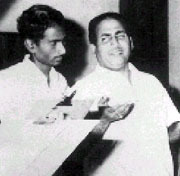 Earlier, music in films was resplendent and exuberant with melodic, artistic and aesthetic elements and played greater role in the film's success because during music sittings, the producer, director, music composer, lyricist and singer all assembled together for unending hours and collaborated arduously to make music by bringing the best out of them unless and until complete satisfaction was achieved. Therefore, those timeless classics are appreciated and treasured even to this day. But sadly, today music composition is a complete farce - a clinical manifestation of stark insanity! There is no time for rehearsal or interaction even! The composer sends the dummy to the singer and instructs him/her to come prepared so as to finish dubbing in the minimum amount of time. From this you can judge the output. Sometimes, if a producer likes a recent hit song of a blockbuster Hindi film, he instructs the music director to straightaway lift the tune without any inhibition. Q. These days loud, cacophonic orchestra dominates the singer's voice owing to which the emotion/ message to be conveyed through the song is lost. Isn't it a disturbing trend? to its original stature. There will be no more hysterical music and perverted lyrics. This is my prophecy. Q. Please enumerate your favourite songs. Spray painting is a painting technique where a device sprays a coating (paint, ink, varnish, etc.) through the air onto a surface. The most common types employ compressed gas—usually air—to atomize and direct the paint particles. <strong><a href="http://www.spraygun.net.cn/">Spray guns</a></strong> evolved from airbrushes, and the two are usually distinguished by their size and the size of the spray pattern they produce. Airbrushes are hand-held and used instead of a brush for detailed work such as photo retouching, painting nails or fine art. <strong><a href="http://www.spraygun.net.cn/p-Airless-Spray-Guns-89706/">airless spray guns</a></strong> spraying uses equipment that is generally larger. It is typically used for covering large surfaces with an even coating of liquid. Spray guns can be either automated or hand-held and have interchangeable heads to allow for different spray patterns. Single color aerosol paint cans are portable and easy to store. site:ollywood.wikidot.com "or Sign in as Wikidot user"